The Cycle for Health logo, via the Buckminster Fuller Challenge Web site. At The City Fix, we were interested in sustainable transport ideas, so it was nice to hear that MIT students took home the top prize for their electric vehicle-sharing program. But one of the “honorable mention” teams also caught our eye for their socially responsible “pedal-powered” initiative to merge the use of recycled bicycles with healthcare delivery in rural East Africa, particularly Uganda. Cycle for Health is a pedal powered catalyst that when placed into a failing rural East African transport system mobilizes medical resources, personnel and patients. The initiative capitalizes on thousands and thousands of bicycles left unused in the garages, apartment buildings and streets of North America by recycling them to rural African communities to save lives. The initiative is an immediate need for rural communities with ample medicine and skilled professionals not being delivered or accessed because of poor roads and the limited use of motorized vehicles. When advanced care is many miles away, timely diagnosis, treatment and drug delivery is critical, especially true in the case of pregnant women and HIV/AIDS, Malaria and TB patients. In the rural setting, mild delays in initial care dominos small, treatable problems into serious ailments, resulting in a long, costly journey for advanced care at city hospitals. 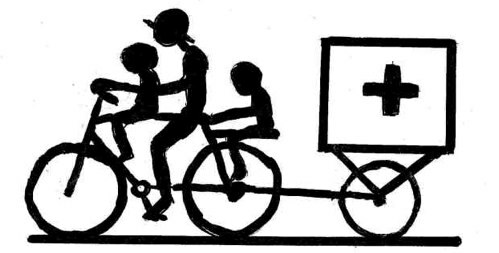 To treat this rural health care problem at its root cause, Cycle for Health collects idle bicycles in North America, packages them with spare parts and tools, and ships them in purchased 40 ft. containers to community based organizations (CBOs) in rural East Africa. The fully stocked, containerized bicycle workshop becomes instant storage and workshop space upon arrival. The non-governmental organization (NGO) First African Bicycle Information Organization (FABIO), trains recipient CBO staff to repair, refurbish and remodel recycled bicycles into ambulances, goods carriers and off road transporters. The bicycle designs are marketed to hospitals, health care organizations, NGOs, and women development groups as a resource to mobilize their resources and improve their services. Cycle for Health is a breakthrough in its comprehensive package of materials and trainings. Where current aid programs see bicycles as a donation dropped into a needy community, Cycle for Health envisions recycled bicycles as a capital to start sustainable small scale bicycle enterprises which improve mobility of medical resources, create jobs, and enhance quality of life.